The Neptune Beach Pearl came into the California Collegiate League playoffs as an underdog with few expecting anything more than an early exit from the CCL newcomers. 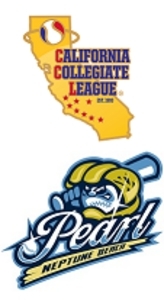 The rag-tag Pearl have played liked poised champions, while the winners of the last three CCL championships – LA Brewers (31-8, 26-7) and San Luis Obispo Blues (41-14, 29-11) – have fumbled around like rookies just called up to the show. The Pearl followed Friday’s 6-3 victory over the Brewers with a 3-1 victory over the Blues on Saturday, taking advantage of four different Blues’ mistakes to score all three runs. The speedy Sapp advanced to third on a two-strike grounder to second by Myles Babitt and scored on a sharp grounder to third by Ozzy Braff to give the Pearl a 2-1 lead they would not relinquish. Two errors and an RBI single by Connor Tekyl gave the Pearl a 1-0 lead in the first. Babitt scored after reaching second on a two-base error by the second baseman and scored without a play when Blues right fielder Collin Ferguson aggressively charged the ball and rather than coming up throwing, the ball squirted away from him allowing Tekyl to reach second. The Pearl extended the lead to 3-1 in the fifth after a leadoff single by Logan Frandsen. He advanced to second on a wild pitch, advanced to third on Babitt’s second two-strike grounder to the right side, this time getting a single. Frandsen then scored on a one-out, two-strike grounder to second by Braff. The Blues rallied from the 1-0 deficit behind back-to-back doubles to lead off the second. Fox didn’t try to throw harder, but continued to ply his craft, getting the next three hitters out without the ball leaving the infield. Fox would need people to make plays, after allowing the leadoff man to reach in the first two innings, he allowed the leadoff hitter to reach in four straight innings after 1-2-3 third and fourth innings. Each leadoff man reaching put the tying run on base or at the plate, but followed with 3 straight outs in the fifth, sixth and seventh. In the eight, he walked two of the first three hitters and Cummings went to the pen for Devon Golden. Golden notched the save, picking up the final five outs, but he too needed the people behind him to make plays. Entering with runners on first and second, he almost made things worse for himself when he bounced a breaking ball in the dirt, but Fishback blocked the ball and picked it up quickly enough to throw out Erik Lewis who attempted to reach third. Sapp followed with another defensive pearl. By getting through the first two games using only three pitchers, Cummings has his ideal matchup going into Sunday. He has closer Evan Rutter fresh to start Sunday’s noon rematch with the Brewers, who recovered from their loss against the Pearl with a 6-0 victory over Walnut Creek and a 7-2 win over SLO last night. Rutter hasn’t picked more than 3 innings, on any level, in a game in over a year, but Cummings said he will take it inning by inning and see how he’s doing.